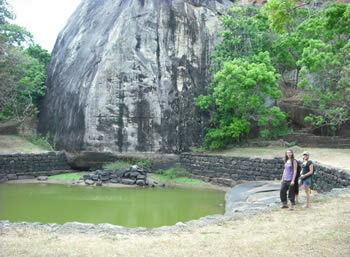 Sigiriya is an archeological site in North Central province in Sri Lanka. 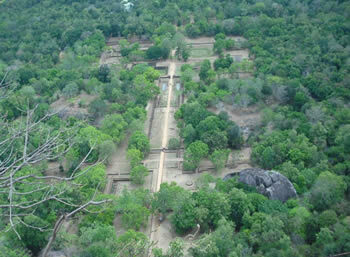 Sigiriya have been inhabited in Pre-Historic times. After introduction of Buddhism, it's rock-shelters ware converted as a mountain monastery from about the 3rd century BC, with caves prepared and donated by devotees to the Buddhist monks. The Mahavamsa, the ancient historical record of Sri Lanka, describes King Kasyapa as the son of King Dhatusena. who murdered his father by walling him alive and then usurping the throne which rightfully belonged to his brother Mogallan. Mogallan fled to India to escape being assassinated by Kasyapa but vowed revenge. In India he raised an army with the intention of returning and retaking the throne of Sri Lanka which was rightfully his. 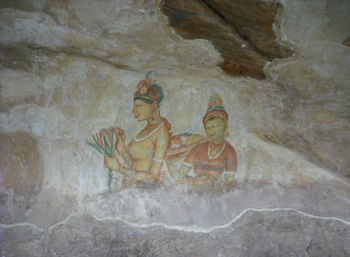 Knowing the inevitable return of Mogallan, Kasyapa is said to have built his palace on the summit of Sigiriya as a fortress and pleasure palace. Mogallana finally arrived and in the battlefield Kasyapa's armies abandoned him and he committed suicide by falling on his sward. 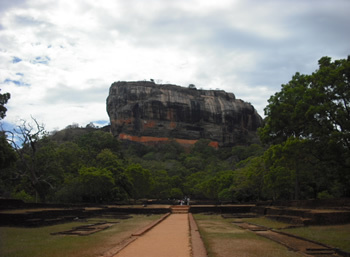 Mogalan returned the capital back to Anuradapura and turned Sigiriya to a Monastery complex. The Sigiriya site consists of a 180m tall granite rock, whose sides are so steep that at some points the top overhangs the base. The palace complex on top of the rock which earliest surviving palace in Sri Lanka. The ruins of various chambers, stairways and pools can be seen there. 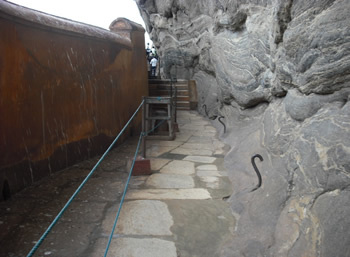 There is a stone stairway leading from the base to the top of the mountain. In the middle part of rock the present remaining of frescos are exhibiting in a cave. 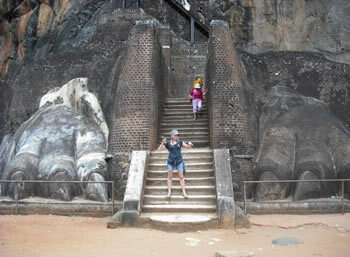 The Lion's staircase at the entrance to the palace is one of Sigiriya's famous features, along with the Apsara (exquisite ladies) paintings on the western rock face and the mirror wall below the paintings. In 1907 one of the British explorer John Still had observed the frescos first time. Seigniorial has a very complex rampart system. The city was walled and mortified. Besides the inner and outer cities within the ramparts, there is evidence of suburban dwellings immediately outside the walled area. The complex is three kilometers from East to West and one kilometer from North to South. Sigiriya was designated a World Heritage Site by UNESCO in 1982. Sir Arthur C. Clark mooted the idea that Sigiriya qualifies to be the eighth wonder of the world, ranked closely with the Great Wall of China and the Taj Mahal. The main places to visit in Sigiriya is he Water Gardens of Sigriya, Boulder Gardens of Sigiriya, Audience Hall of sigiriya, Cobra Hood Cave at Sigiriya, Preaching Rock at Sigiriya, The Lions Platform of sigiriya, Mirror Wall at Sigiriya, Frescoes of Sigiriya, The Palace on the Summit at Sigiriya.